Crews in the District are digging into a busy roadway and shoring up the area around a large hole that opened up on 17th Street, Northwest, about a block from the White House. EDITOR’S NOTE 5:33 p.m.: This story has been updated to reflect new information from PEPCO. 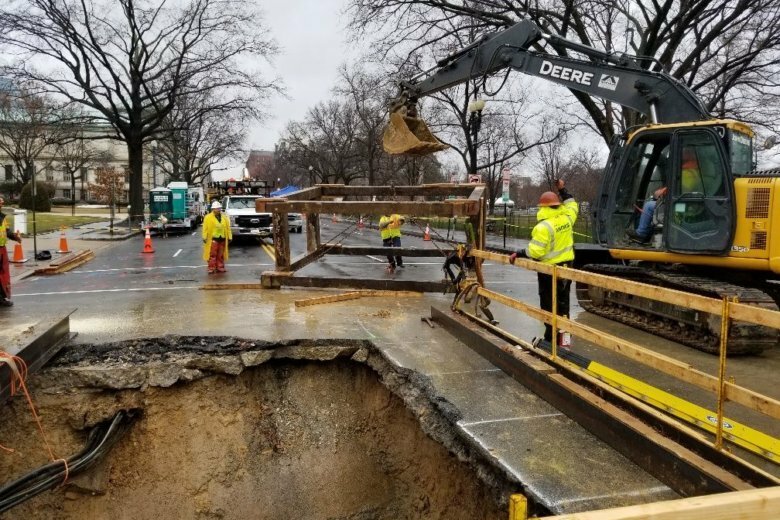 WASHINGTON — Crews in the District are digging into a busy roadway and shoring up the area around a large hole that opened up on 17th Street, Northwest, about a block from the White House. According to DC Water, an underground sewer line was damaged and must be repaired before the hole can be patched up. The power company will reenergize them once the sewer is repaired. Crews will then fill the hole with dirt and restore the surface of the road. They hope to be completely done with the project by late next week. Until then, 17th Street remains closed between C and E streets. D Street is also between 15th and 17th streets. The cause of the hole is not yet known. “Our priority is repairing the roadway and getting everything back to normal. Then we’ll try to figure out what led to this,” said Lisle.